This has been a busy year, having built a new smaller kiln, and having conducted lots of glaze and clay experiments, the latter exclusively with NC minimally processed clays. 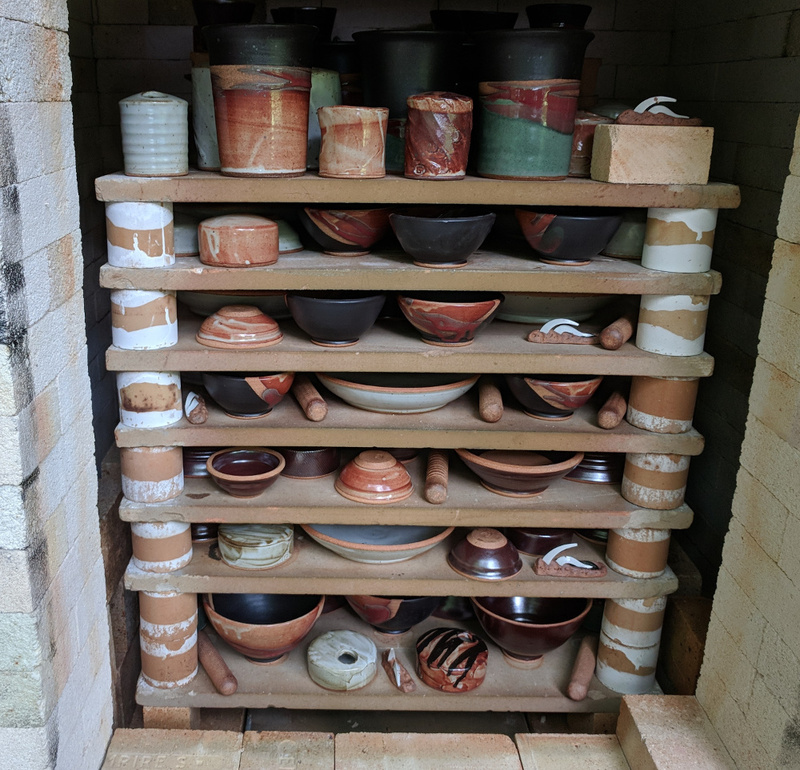 The smaller kiln was built in hopes of having quicker turnaround times between making and firing, but the closer we got to the holidays, and the more pots stacked up in need of glazing and firing, the more I have relied on Big Bertha, my old car kiln. As I write this I'm gearing up to fire Big Bertha again this week, and possibly a smaller load in Little Bertha next week. Whew! In the event you can't make it here, we are also in the following NC galleries - Seagrove Pottery in Cary, Baxter's in New Bern, and Pea Island Art in Salvo. The Southern Christmas Show (thanks to Dan Triece of Dirtworks Pottery), November 8 - 18, at The Park Expo and Conference Center in Charlotte, NC. From November 17 through January 5, I will have pots in the Holiday Gift Invitational, Christmas at Captain White's, at the Alamance Arts Council, Graham, NC. From November 24 through January 4, my work will be in the first Holiday Invitational at the Center for Visual Artists in Greensboro, NC. Saturday, November 17, I will be participating in my annual trunk show in Wilmington, NC. This is a private event so please send me an email for an invite if interested. That's all for now. I have to get back to glazing pots and loading kilns! We hope to see you all soon!